Tea Circle reviews the first of four panels from a recent Oxford workshop on the Karen. On Thursday, 15th June researchers and practitioners working with Karen communities within the context of the Myanmar’s ongoing democratic transition joined together for a special one-day workshop, ‘The Karen in 2017: Resilience, Aspirations and Politics’, convened by the Programme on Modern Burmese Studies (MBS) at St Antony’s College. In a unique collaboration between research fellows and students from the University of Oxford and the Australian National University’s Myanmar Research Centre, the event brought together students, academics and commentators with development practitioners and activists working in a range of fields and interventions in Karen State, Karen refugee and diaspora communities. As Dr Matthew Walton, MBS Director, made clear in his opening address, the workshop set out to take stock of the promise and pace of substantive change and progress for these communities since the signing of a ceasefire between the Karen National Union (KNU) and the Myanmar government in January 2012, and the long-awaited accession of Daw Aung San Suu Kyi’s National League for Democracy government in March 2016. Participants were specifically asked to reflect on the adaptive strategies, politics and aspirations of ordinary Karen people and ethnic leaders navigating Myanmar’s often uneven and uncertain transition to peace and democracy over recent years. The workshop was structured around four main themes and panels: (1) Aspirations, Education and Health; (2) Livelihoods and Social Protection; (3) Migration, Conflict and the Borderland; a plenary session considered (4) the Future of Karen in Myanmar/Burma and the Diaspora. Through case studies and comparative insights, panellists highlighted the range and resilience of Karen institutions and organisation whilst considering the nature of existing challenges and persisting constraints. This afforded particularly valuable insights around community-based responses to the management and maintenance of the ceasefire in post-conflict areas, informal welfare provision and approaches to community protection, collaborative development interventions, and Karen political mobilisation and aspirations in Myanmar and the Karen borderlands. Joining the panellists were some forty participants, many of whom brought considerable practical experience to the lively discussions that followed presentations. In this and subsequent posts over the coming days we provide commentary on each panel and what individual contributions and current research might suggest for the Karen moving forward in 2017. In his opening remarks for the initial panel on ‘Aspirations, Education and Health,’ Mr Richard Dolan, a DPhil candidate at the Oxford Department of International Development, made some general comments about the political alignment of state and non-state structures in the provision of essential welfare services in Myanmar today. He pointed out that a protracted reform process around state provision of education and the planned convergence of state and dominant non-state education and health systems, associated with ethnic armed organisations (EAOs) like the KNU, have had significant and immediate consequences for Karen communities. These state and dominant non-state visions of education and health reform, with their potential to improve the lives of many Karen, remain in political deadlock as part of the wider peace and reform process and therefore that potential has yet to be fully realised on the ground. That said, these processes have brought with them greater freedom and space for communities themselves to engage around education and health and to access the resources to develop alternative responses. Such community-based initiatives, which were very much the focus of this panel, are therefore crucial areas of welfare development for many Karen people; the priorities and aspirations currently framing them might suggest what is considered at stake in these areas and the wider transition. In her presentation ‘The Karen and the Gift of Education’ Dr Pia Jolliffe, Research Scholar at the Oxford Institute of Population Aging, shared insights from her long-term ethnography of education and intergenerational learning in a Christian Karen community in northern Thailand and more recent work with Karen diaspora communities in London and Sheffield in the UK. Her work provides an exciting opportunity for comparative insights between a number of different Karen communities and cross-cultural encounters. Drawing on anthropological notions of education as a non-material exchange good and gift, her current research explores how the currency of education is viewed and valued by different Karen communities across time and space. Furthermore, by situating education within broader notions of economic and political exchange, Jolliffe shows how education-as-gift is received and ultimately reciprocated in different contexts. Through the use of participatory research methods and, in particular, her respondents’ pictorial timelines, Jolliffe’s work illustrates the graphic interplay between aspiration, opportunity and constraint in these contrasting locations. 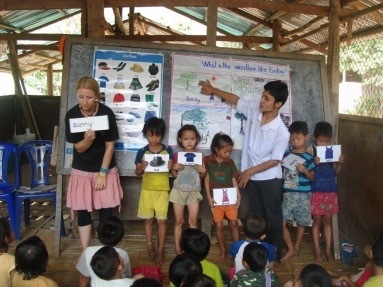 The aspirations of many of her young research participants pointed to potential roles and pathways in support of Karen communities specifically through the development of Karen education and schooling. However, within the context of migration and internal displacement on the Thai-Burma border, her research shows how the currency of that education appears to be shifting. Culturally relevant learning such as rice farming and weaving is increasingly challenged by new forms of learning largely prompted by international and faith-based development interventions. Whilst this is particularly true of Karen diaspora communities in the UK, where young Karen are regularly exposed to western forms of knowledge and practice, there is also evidence that expressions of Karen cultural knowledge and identities are exchanged and preserved through diasporic and transnational networks. In his presentation, ‘Karen, Education and the Diaspora’ Mr Bob Anderson, founder and programme director of Mobile Education Partnerships (MEP), acknowledged similar tensions emerging around many education interventions for Karen communities on the Thai-Burma border which he and his organisation have worked hard to mitigate. Anderson began by providing an account of this work and how it had changed amidst rapidly shifting political and economic constraints. Early work revealed a shortage of suitably qualified teachers in the refugee camps and demand for a training model which might respond to this deficit whilst redressing the current imbalance in development support. MEP’s adaptive and reflexive response mechanism has since supported schools and communities by providing access to pre-service teacher training in particular. It continues to do so in the context of the ongoing transition as part of its Basic Education Support Towards Transition (BEST) programme, which now involves work inside Myanmar in areas of Mon and Kachin States. Mr Anderson noted that the fault lines of cultural compromise were particularly acute around the use of the language of instruction, teaching and learning styles, resources and textbooks but stressed that these were themselves platforms for cultural cooperation upon which ‘to blend the best of the East with the best of the West’. To this end, he stressed that there was, for example, a place in the development of Karen education for teacher-centred explanation as much as student-centred learning. MEP has, as a result, been instrumental in developing culturally appropriate textbooks and teaching resources in English and in the training of Karen teachers in the use of these materials. Indeed, he acknowledged that as many young Karen look to a future outside the camps and refugee communities the demand for English and the opportunities it promises is that much greater. And whilst he acknowledged a potential ‘cultural clash’ through the international assessment of Karen teachers, the responses of these very teachers with which his presentation ended suggested that such credentials had, at the very least, enhanced their confidence and capacity to support their communities, and in so doing, navigate the uncertainty of the transition in the borderlands. The pervasive sense of uncertainty and instability on the border today is clearly amplified for migrant and refugee populations already at high risk of poor health outcomes. In her presentation, ‘Perinatal Depression among Karen and Burmese Women on the Thai-Myanmar Border’ Ms Gracia Fellmeth, a DPhil candidate at the Nuffield Department of Population Health, emphasised that shifts in development and funding priorities as a result of the ongoing transition in Myanmar were disrupting the support and sustainability of health systems for many women suffering from perinatal depression. Her doctoral research reveals a tangible connection between such developments and the nature and extent of perinatal depression. A particularly disturbing insight is that around suicidal ideation which has, over recent years, accounted for the majority of maternal deaths on the border. Moreover, Fellmeth’s work suggests that suicidal ideation is particularly prevalent in those suffering from mild or even negative perinatal depression and is therefore common even in the absence of severe depression. The qualitative dimension of this research offered moving testimony of the factors driving depression amongst these women. Indeed, a picture emerged in which persisting social problems amongst migrant and refugee communities such as poverty, domestic violence and family fragmentation are seemingly exacerbated by the hopelessness and uncertainty prompted by changes to health systems and support. Risk factors associated with perinatal depression are therefore closely related to the broader social context and dynamics of flux and change in the Karen borderlands. And it was in light of this conclusion that participants subsequently discussed the cultural and comparative dimensions of Bamar (Burman) and Karen motherhood. It was suggested, for example, that the notion of pregnancy amongst Bamar women is commonly seen as something which must be suffered and worked through in return for the gift of children and therefore understandings of associated depression may vary and thus go untreated. This suggests that specific Karen cultural norms and values might figure as significant dynamics in cross-cultural encounters around the diagnosis and treatment of perinatal health for refugee and migrant women. In the final contribution to this panel Ms Justine Chambers, a PhD candidate at the Department of Anthropology, Australian National University, explored how socio-economic and political change can and is being exploited to positive effect through new educational sites inside Myanmar. In her presentation, ‘Coming of Age in Hpa-an: Hope and Visions of the Good Life’, she explored the role of hope through an English learning centre in Hpa-an, the Karen State capital, and the life story of one of its students. She conceives hope as both a forward-looking stance and a value-making process anchored in concrete practices that shape young people’s ‘ethical imagination’ and visions of the ‘good life’. Chambers therefore identified how these learning centres might prompt young people to generate socio-moral understandings of themselves and aspirations for upward social mobility. As her case study suggested, such educational opportunities have expanded young people’s sense of what it means to be a productive member of society in Hpa-an today. In this way, her doctoral research suggests that hope through education might work as a mechanism for channelling constructive orientations towards the future as young people apprehend and navigate the shifting structural realities of the ongoing transition. Interestingly, by considering the role of hope in relation to education in this way, Chambers suggested that the effects of rapid changes wrought by the transition are ultimately unstable and unpredictable, precisely because the structural realities facing most young people are always exceeded by the hopes and fears that are invested in them. This contribution raised further discussion about the role of religion in framing moral conceptions of hope as linked to non-state education and health systems. It was suggested that philanthropic and humanitarian support for welfare initiatives are not simply about giving and receiving but are often entangled in complicated power relationships that are increasingly marginalising groups based solely on the border through their diminishing access to support and funding. These panel presentations also prompted further discussion about the imprint of western knowledge and practices through development as Karen communities inside Myanmar in particular become increasingly accountable to external actors and agenda at the potential expense of their own priorities and aspirations. This led to a discussion of mother-tongue based (MTB) education for the Karen given the increasing role of English as the medium of instruction within many informal learning spaces. The implications of language preferences more generally excited a lively discussion around the role of service delivery and its relationship to the administrative basis of the Karen cause moving forward.